Dare you play the hardest games ever? Lock the doors, buy a couple of spare controllers and put Mum on speed dial (so you can go crying to her later); here are 8 of the hardest games ever. What else can be said about Dark Souls, the game that inspired a gazillion ‘OMG THIS GAME IS SO HARD’ articles? It’s definitely the hardest game we’ve ever played, and not just because of the notoriously hard-to-master combat system. Dark Souls is wilfully obscure, feeding you very little in the way of guidance or plot and letting you find out stuff on your own. Take one wrong path and you could end up becoming dinner for an army of giant skeletons. Or invincible wraiths. Or demons with big lightning sticks. To make matters worse, Dark Souls never gets easier. After 10 hours, we thought we had the game sussed…then we met a chap with two doggies from hell and realised we knew nothing. Bear in mind this game lasts 100 hours – how much harder can it get?! …Until you reach the speedbike level. Notorious for being teeth-shattering difficult, the speedbike level ask you to navigate an obstacle course on the back of a speeding motorcycle. It’s nigh-on impossible, the benchmark against which all game difficulty is measured. It takes years of mastery, and then you still need luck: it’s the speedbike level, and it’s going to eat you for breakfast every day for the rest of your life. Videogames were invented so normal people could pretend to be ninjas. Seriously, how else are you going to do it without getting arrested? Unfortunately, Ninja Gaiden shares the shocking truth about being a ninja: it’s ridiculously hard. From the off, Gaiden requires lightning reflexes, perfect timing and an intimate knowledge of combos. The typical game of Ninja Gaiden goes like this: put disc in, press start, meet first baddie, get killed. Repeat 10 times. Throw controller against wall. Pick it up and spend hours mastering techniques to kill first baddie. Get through the first level. Meet boss. Die countless times. Repeat until the end of time. We’ve never even seen this game past the first boss. Does it get any easier? I Wanna Be The Guy is the only free download we’ve ever regretted. A homage to retro platformers, it’s tougher than Bear Grylls eating a well-done steak after punching a shark in the face. The few sections you’ll actually see you contend with invisible platforms, spikes and countless other traps. It’s a game of trial and error with extra emphasis on the error, and it only gets worse from there. Punch Out is a cutesy-looking boxing game in which you fight boxers of various nationalities on your way to the world title. However, behind those cute graphics lies a demon, and that demon is none other than Iron Mike himself. Tyson is the final boss in the game and your fight with him goes about as well as you’d expect, with Mike knocking seven bells out of you while flashing his trademark grin. 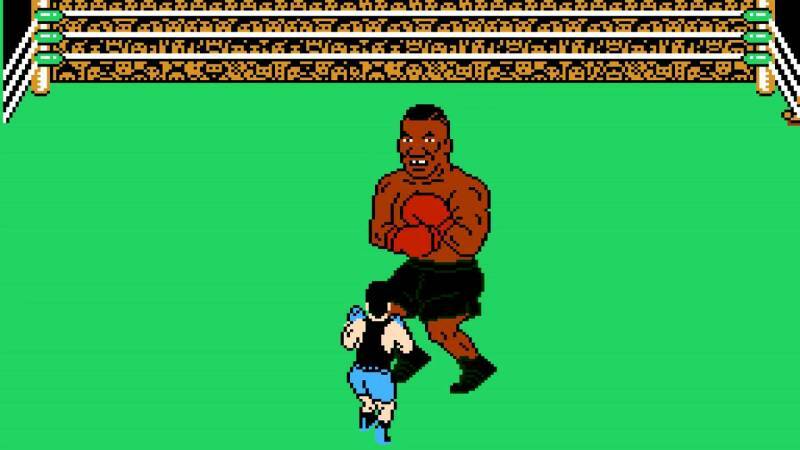 Videogame Tyson is so tough that not even the real Mike Tyson can beat him, as shown in the video below! You’ve got three lives, unlimited ammo and a whole army of aliens to kill. What’s hard about that? Well, a single hit will kill you. Lose all three of your lives and its back to the start. Essentially, you’re allowed to get hit three times in a game where bullets are as common as air. Fortunately, Konami created the legendary Contra code, a series of button presses that gives you 30 lives. It made the game slightly easier. But only just. Ikaruga is a space shooter, similar to R-Type, with a unique gimmick: your ship can change colour. This allows you to absorb bullets of the same colour, but makes you more vulnerable to bullets of the opposite colour. Unfortunately, there are so many bullets flying around on screen that its like someone throwing a bag of M&Ms at your face and asking you to only catch the red ones in your mouth. Resident Evil begs a question many people have been asking for years: how would you survive a zombie attack if you had the mobility of a tank? The answer: not very well. Getting past zombies in a small corridor is pretty much impossible, which means you have to shoot them. However, bullets are scarcer than water on Mars, which means you end up meeting bosses possessing nothing more than a lighter and a key for a door you haven’t found yet. What is the hardest game you’ve ever played? Let us know in the comments. And don’t forget, you can sell games online with musicMagpie! Just click below to get started.